Extend DisplayPort 4K30 and USB 2.0, 100-meters over CATx. Single- or dual-head DisplayPort video resolution 3840x2160. Extends DisplayPort, USB 2.0, USB HID, and digital/analog audio over CATx cables. Extend 3840x2160 4K or 2560x1600 dual-link video up to 330 ft. (100 m). Extend 1920x1080 dual-head video up to 492 ft. (150 m). Support for USB keyboards, mice, tablets, and touchscreens. Extension distance is up to 492 feet (150 m) for a single 1920 x 1080 screen, depending on cable type. Extension distance is 330 feet (100 m) for two 1920 x 1200 screens, or a single high resolution screen to 3840 x 2160. Supports Mac Cinema Display (2560 x 1440). Supports keyboard, mouse, tablet, and touchscreens. Can also support 1920x1080 @ 120Hz when using a single video channel. Uncompressed system where by every pixel of every frame are sent without loss. Receiver supports DisplayPort Dual Mode, which allows monitors that only support HDMI or DVI to be used. Enables connection of any USB human interface device from mice and keyboards through to graphics, tablets, and more. Use one CATx cable for basic performance and two CATx cables for highest performance. The Black Box DisplayPort Extender is a high-performance KVM extender that enables you to locate your critical computing hardware in a secure and temperature controlled environment away from the user work station while maintaining the same user desktop experience. It can transmit either two 1920 x 1200 video streams or one higher resolution video stream (2560x1600 WQXGA), digital audio (S/PDIF), analog audio, Hi-Speed USB 2.0 and USB 2.0 (full and low speed) over CATx cables. The system is uncompressed, sending every pixel of every frame without loss. The receiver supports DisplayPort Dual Mode (DP++), meaning monitors that only support HDMI or DVI can be used (with the correct adapter cable). Video, USB, and audio all pass along a single cable. 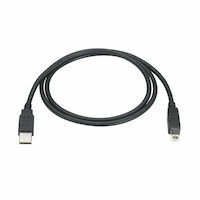 A second CATx cable is required for the Hi-Speed USB 2.0 extension and increased video bandwidth. Distance is dependent on the monitor resolution, number of monitors, cable type, and the number of patch panels and couplers. Enables connection of any USB human interface device from mice and keyboards through to graphics tablets, jog wheels, joysticks and 3D explorers. Mass storage devices and isochronous devices such as webcams and headsets can be used through the transparent USB 2.0 Hi-Speed port. Supports the S/PDIF interface via an optical 3.5mm jack socket (dual use with analog audio via mini Toslink). HD-audio quality (stereo channel 24 bit sampled at 96kHz) is available to transfer audio from local to remote for Line In / Line. Headsets with integrated microphone are also supported. The KVM DisplayPort Extender USB 2.0 Single/Dual-Access CATx comes with a standard 2 Year Double Diamond™ Warranty (Standard) already included.